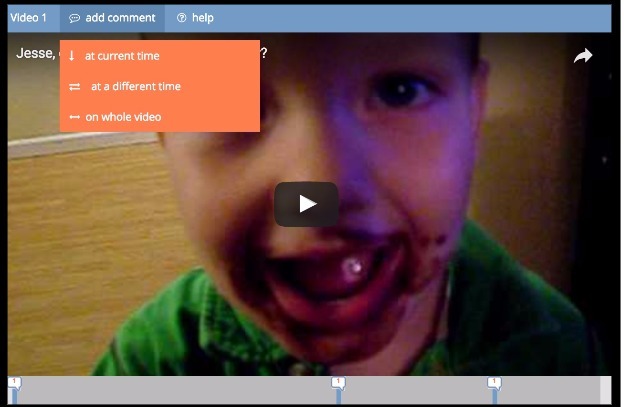 All video documents work best our 2-pane (default) view. 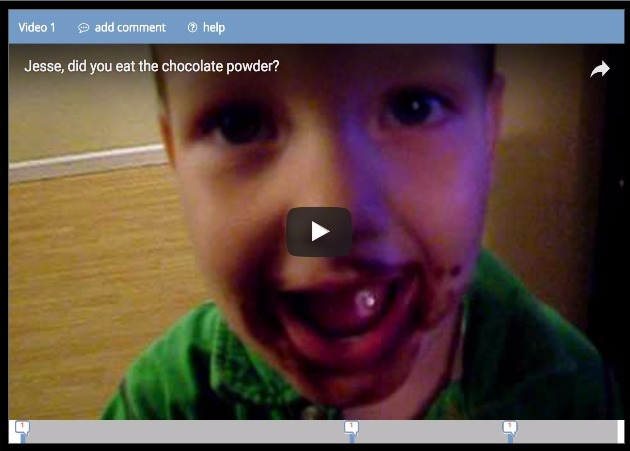 A video hyperlink to the corresponding right-pane comments. The first video&apos;s link have the label “Video 1”, the second “Video 2”, etc. A link to the “help” page you&apos;re reading now (this is actually the 3rd link, but we&apos;re getting it out of the way before tackling the “add comment” link). 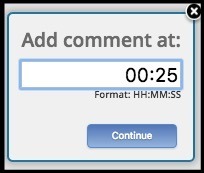 you then specify the desired time (in HH:MM:SS format, meaning Hour:Minute:Second), and NowComment will immediately show you the video frame at that time so you can keep changing the time until you&apos;re happy with where your comment is placed. You then click the “Continue” button to move on to the same “add comment” window described above. For both the “current time” and “different time” options, blue vertical comment bars in a gray area directly underneath the video player show where existing comments are. To make a general comment not related to any particular part of the video, choose the “on whole video” comment option. Existing whole video comments will only show in the comment area, not underneath the video player. Note: when you start making a comment the media player stops immediately so you don&apos;t lose your place in the video stream while you&apos;re concentrating on what you&apos;re writing. Clicking on a vertical comment bar will scroll your screen to highlight the corresponding comments without moving the video&apos;s progress bar from its current position; this lets you see what others are saying without losing your place in the stream. Clicking on the timestamp header above the text of a comment (i.e. the right pane in 2-pane view) will move the progress bar to that point in the stream (e.g. in the screenshot above, clicking “00:27” in the right comment pane will move the left pane video to the 27 second point in the video) and the video will immediately start playing from that point. 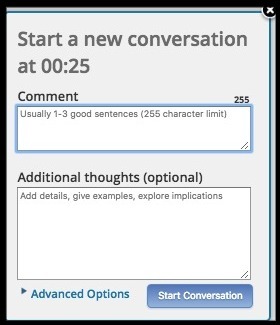 Note: we can integrate other 3rd party sites with NowComment at a very reasonable cost. Please contact us if your school or organization would like NowComment to support in-context commenting for SoundCloud, C-SPAN, CNN, or other audio/video sites. click the “Show options” link to override the “Responsive” default and choose “Fixed Size” instead (don&apos;t necessarily choose the size shown in our screenshot). Once the options are visible, for “Size” choose “Fixed Size” rather than the default “Responsive”.